A dominant part of software development and maintenance is adding new or changed features to existing code. This means that the cost of software development and maintenance is in part determined by the maintainability and stability of the code. 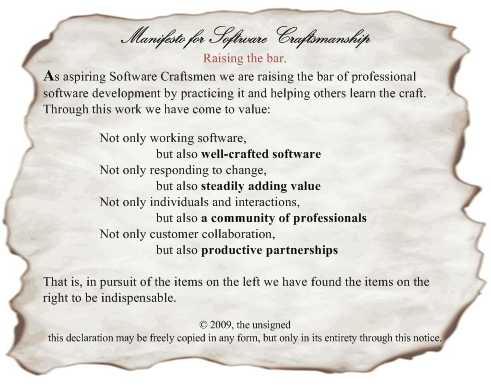 This is one of the messages the Manifesto for Software Craftsmanship, as shown in Figure 15, is trying to bring across. Delivering well-crafted software is the only way to ensure that business value can be added at a steady, predictable, cost-efficient pace throughout the solution's lifecycle. XP is a popular Agile method containing specialist practices for maintaining stability and working on quality. It's practices are inspired by widely used and proven ways of working, taking them to their extremes and leaving out all others that don't directly add value for the customer. In this section we will look at some of the XP practices that are directly concerned with delivering and maintaining quality and aren't addressed in Scrum, RUP or the Agile mindset in general. This is part 2 of 3 posts on Scrum. Part 1 of this post is Self-organize using Scrum. Within a Scrum Team, Scrum recognizes three roles as depicted in Figure 13. This is part 1 of 3 posts on Scrum. Let’s take a closer look at the three parts of this statement.